Add this black bean soup recipe to meals you can make in less than 30 minutes. For the person who is on the go, this low calorie but filling dish is a quick and satisfying solution. Yes another delicious meal whipped up in minutes, but what I love most is how inexpensive black beans are yet they pack such a nutritious punch. Black beans offer lots of fiber which aids in digestive issues, such as constipation. They also provide much need folate (vitamin B6), iron, magnesium and antioxidants into our diets and are considered a healthy food choice. 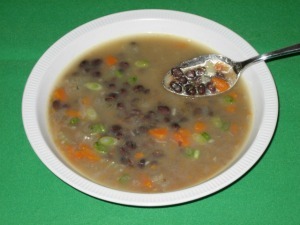 So when planning your weekly meals why not include a delicious big bowl of black bean soup? Or better yet make a small pot of it so it’s handy in the refrigerator. It can be a quick snack or meal when you are strapped for time. Also the cost savings of most bean recipes can be quite a delight on the pocket book. In a large soup pot add oil, onions, garlic, carrots, celery, cumin, salt and pepper. Sautee ingredients over medium heat for about 5 minutes until onions are translucent and vegetables are softened. Add broth, water and beans and bring to a boil. Reduce heat, cover and simmer for 20 minutes. Once the soup has cooled down take half of the soup out of the pot, blend and purée this half of the soup until smooth. You can use a blender, food processor or a hand held immersion blender, whichever is more convenient and then return the puréed ingredients back into the pot. This will give the soup more body and thickness. If you don’t have any ham broth available you can substitute it with water or another type of broth of your choice such as chicken or beef.